Spanish 21, or as our friends down under like to call it – Pontoon; is a version of Blackjack that is not only fun to play, but one of the best bets in a casino. If you are lucky enough to find the game that is. 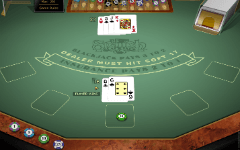 Spanish Blackjack isn’t spread as often as other Blackjack games due to the low house edge. As a rule of thumb, if you have the option to play Spanish 21, play it! Spanish 21 is kind of like taking the best parts of every Blackjack version and creating a new Blackjack version around them. Most Blackjack games will have some good and bad. All the bad things like not being able to re-split Aces, are designed to give the house a higher edge. However, you can find just about all of the “Good” that is found in other versions. The main difference with this version is absence of all the 10’s. There are still Jacks, Kings and Queens; but the literal 10 cards are removed from the deck. A standard shoe consists of 6 to 8 decks with 48 cards in each deck. As per standard Blackjack games, players can double down on their first 2 cards. However, Spanish 21 lets you double down on many occasions. You can double after a split. You can also double down after each hit if you prefer. Finally, there’s the option to double after splitting Aces. After doubling down you will receive only one additional card. Then you can either stand or surrender – double down rescue. You can split any two hands with similar value. You can also split and re-split Aces. The possible number of splits vary between the games, but usually it’s up to 3 hands. Spanish 21 also allows players to use the late surrender when a dealer shows a 10 or Ace. Spanish 21 has a unique way of rewarding 21’s and Blackjacks. 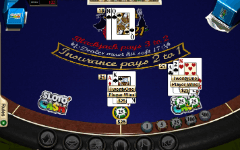 The most lucrative is the fact that the dealer cannot tie when the player has 21 or Blackjack. All player 21’s and Blackjacks beat the dealers 21 and Blackjacks. Not only do you always win with 21, it also pays off if you make 21 a certain way. Dealt Blackjacks pay the traditional 3-2. While all other 21’s are paid even money. 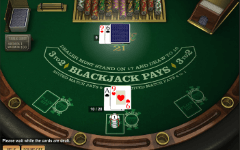 Spanish blackjack has a few other tricks up its sleeve. These tricks, or treats if you will, come in the form of bonus payouts for getting certain card combinations. 7-7-7 of the same suit when the dealer shows a 7 pay 50:1. Most of these bonuses do not pay if you have split or doubled. You can split 3 times. You can re-double once and receive additional card. Suited 7s with dealer’s 7 pay $1000 for $5 – $24 bets. $5000 for higher bets. Additional Match the Dealer side bet. The number of decks is not disclosed. Suited 7s with dealers 7 pay 40:1. The main strategy is to utilize the choice to double down at any time. Use this always when you have a total of 11, regardless of what the dealer shows. 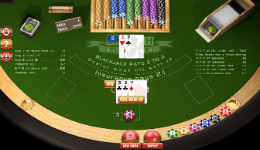 You also want to take advantage of the option to split Aces. Avoid trying to hit the bonus payouts, such as going for a 5 card 21 and so on. Doing so will deviate from an optimal strategy; and the payoff when you do win the bonus will not compensate for the loss of statistical advantages. Overall, Spanish 21 is a fun game to play and has a low house edge. So, if you’re looking for a new way to play blackjack, Spanish 21 could be your answer.